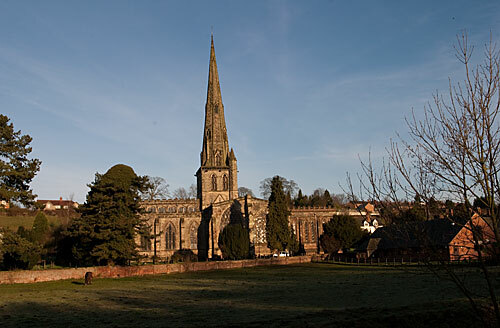 The church is one of the glories of Derbyshire, its tower and spire dominating the small town, the spire rising to 212ft. St Oswald was a popular Anglo Saxon saint. He became king of Northumbra(635-642) and brought St Aiden from Iona to Lindisfarne; their efforts were largely responsible for the conversion of that kingdom and the foundation of the Northumbrian church. The transepts contain 2 chapels dedicated to 2 leading local families, the Bradbournes and the Cockaynes, later the Boothbys. The Boothby chapel is full of monuments, amongst them a memorial to Joan and Edmund Cockayne(1404), Sir Humphrey and Lady Bradbourne(1581) and Sir John and Lady Cockayne(1447), but these are all outshone by the memorial to Penelope Boothby, a six year old who died in 1791. During life, Penelope had been painted by Joshua Reynolds and in death immortalized by Thomas Banks, best known for his memorials to Burgess and Westcott in St Pauls Catherdral. 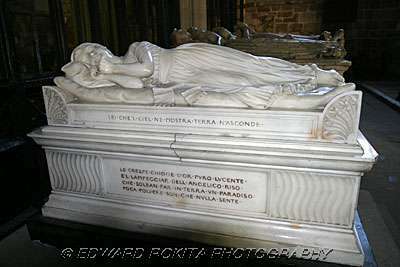 The white currara marble figure of the child is so lifelike that she still appears to be only sleeping. Her epitaph reads `She was in form and intellect exquisite, the unfortunate parents ventured their all on this frail bark, and the wreck was total`. The church consists of a nave and south aisle, crossing with crossing tower and spire, transepts with aisles as wide as the transepts and a long chancel. A church has stood here, possibly of the same size since Saxon times. A norman crypt was found during excavations in 1913. St Oswald's contains a 13th century font and many fine examples of stained glass.